These are wise words from our Project Dietitian Sally Grubb, who wants you to know more about simple ways to help prevent weight loss and malnutrition. 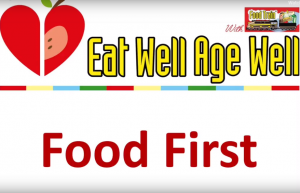 Our video on food fortification explains how adding calories and protein can be helpful for an older person at risk of malnutrition. If you have any queries then please don’t hesitate to contact us. You can also find more Food First information on the BAPEN website.